Hi everyone. CK here. The man you see above is Five Pete. Five Pete is a super Phillies fan who likes to do cool stuff like party and eat pizza and win championships. 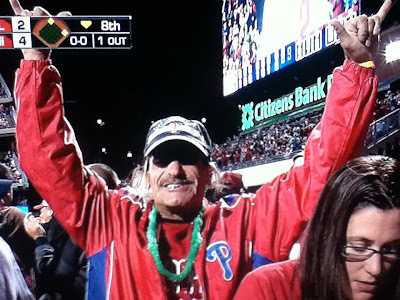 Five Pete is also the *OFFICIAL* 2011 Phillies Playoff Rally Fan as deemed by me, on this the 17th day of September, 2011 AD. So come this October... whenever you're in a pinch... whenever you need a little pick me up... whenever you feel like you could use that extra boost... look to Five Pete. He'll be there. He'll always be there. I thought that was Moyer. HAHA I LOVE YOU ANON. Dude, Back to the Beach h/t? Best unexpected tag ever!